Welcome at Shell Berchem, the biggest station in the world. We are committed to the well-being of drivers. Shell Berchem is our largest retail station globally, located on the E25/A3 towards Luxemburg and Belgium, it acts as a key location to serve your business in Europe! 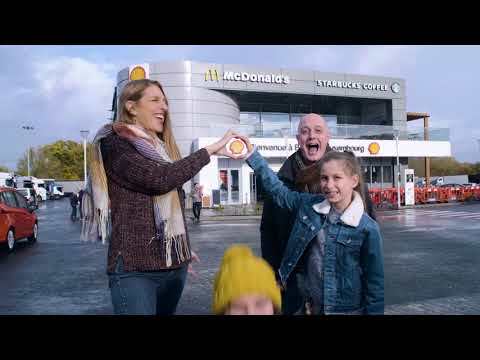 Shell Berchem offers access to 24 Diesel pumps and 24 AdBlue pumps for trucks, meaning your drivers can avoid queues when refuelling and get back on the road! All pumps onsite offer an innovative super-fast refuelling system, this unique system where drivers swipe their card once at the pump and refuel their tanks at the same time, helps your trucks refuel nearly twice as fast! A new multilingual customer screen system has also been installed at each Truck pump to communicate directly with your drivers, in 13 different available languages! Your drivers can find out information about promotions onsite or other valuable information such as the latest weather and traffic updates. At Shell we understand that your drivers need to refuel just like your vehicles, that is why at Shell Berchem we offer truck drivers who refuel more than 500L a free coffee and a 50% reduced price on the trucker menu at Deli2go, as well as access to our luxurious 2theloo toilet and shower facilities. We also have a McDonald’s and Starbucks on sites, where you drivers can purchase coffee and snacks or get a McDonald’s Big Mac meal for €4.95! To ensure your drivers and vehicles are kept safe when refuelling we have also installed improved security equipment across the site to give you peace of mind. Different coloured tankers parked at a garage. Shell sign outside petrol garage. Camera pans across garage forecourt to show tankers at petrol pumps. Close-up of attendant filling up truck. Close-up of someone paying by card. Close-up of attendant choosing which type of pump and fuel. Attendant pumping fuel. A screen shows the increasing amount of fuel being pumped. Scene showing a security camera. Close-up of man holding receipt. Picture of red truck. Close-up of man collecting change from machine. Shell Select sign. Interior of shop at garage. Two female assistants behind counter smiling at customer. Close-up of bakery counter, showing bread on shelf. Sped up footage of customers moving around shop. A bank of refrigerators. Customers walking through the shop. Person taking bottle marked Helix HX7 from shelf. Shell Select sign pans down to show what is available. Interior of brightly lit McDonalds restaurant with customers sitting at table. McDonalds sign. Assistant packing food into brown bag. Assistants waving at camera. Customer walking towards an Ola concession. Customer choosing confectionary. Smiling assistant behind counter. Confectionary falling into cup. Customer paying for purchases. Sign on wall – 2the loo with direction arrows. Inside of bathroom showing wash basins. Another 2the loo sign on wall. A machine ejecting a ticket. An assistant writing Trucker Stan with smiley face on paper cup, fills with coffee, places in holder and hands to customer. Smiling assistant handing coffee to customer. Exterior view of garage forecourt from inside shop. A trucker walking towards his truck. Trucks pulling in and out of garage. Trucks parked in full parking bay. Sped up footage of traffic.